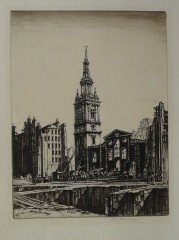 Henry Rushbury, etcher, watercolourist, born in Harbourne, Birmingham, in 1903. Rushbury attended Birmingham School of Art free as a gifted elementary School pupil and won a succession of scholarships. It was here that he made friends with Gerald Brockhurst and also studied decorative and stained glass design. On leaving he became an assistant to Henry Payne (1910-12) and worked on the Chapel at Madresfield Court, Worcestershire. In 1912 he went to London and joined Brockhurst in Chelsea. It was through a chance meeting with Francis Dodd, who suggested that he should try etching and introduced him to the dealer-publishers Dunthorne and James Connell. Rushbury married in 1914 in Chelsea, his best man was another artist, Job Nixon. In the First World War he joined the army as a draughtsman, later transferring to the Royal Flying Corps before he became a War Artist in 1918. Rushbury spent a short time under Tonks at the Slade. In 1920 he started a tour around Europe and spent several months travelling. In 1921 he was elected as an associate of the Royal Society of Painter-Etchers and Engravers, becoming a member in 1922. By the late 1920’s, although selling prints was more difficult he managed to get work illustrating books for Macmillians, designing posters and murals. The family moved to Suffolk in 1930. He became Keeper to the Royal Academy (1949-64), elected R.A 1936. At the start of the Second Worlds War, Rushbury became a War artist for a second time. As a visitor in engraving he taught at the Royal College in 1942 as it had moved to Ambleside for the duration of war. After the war he taught at Rome at the British School .On his retirement in 1964 he was knighted.